The word sustainability, used in a context to mean environmental sustainability, was first coined by Lester Brown 25 years ago in his book Building a Sustainable Society. In the same context, the term 'sustainable development' was popularised by the World Commission on Environment and Development (WCED) in its 1987 report entitled Our Common Future. (The WCED is also known as the Brundtland Commission, after the Chair of the Commission and former Prime Minister of Norway, Gro Harlem Brundtland and was the direct precursor of the 1992 Earth Summit in Rio). Sustainable development was defined as development that “meets the needs of the present generation without compromising the ability of future generations to meet their own needs”. Ever since, and particularly after the Rio Earth Summit, politicians have neatly twisted their obligations and commitments towards environmental sustainability into working towards economic sustainability, something very much more interesting to them. All of which is a very wordy introduction to me saying that although much of what Gabrielle and I are trying to achieve here is to live our lives in a low-impact, environmentally sustainable way, we need to be economically sustainable too. To anyone contemplating a move to the French countryside in search of a better life, I would urge them to first consider how they are going to earn their living. Particularly down in the Limousin region, where I started out, employment was the prime make or break factor to them staying or returning to the UK. 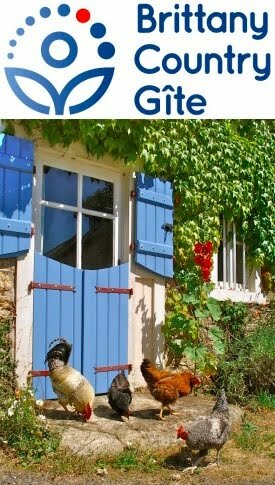 And too many of them came out to what was perceived as one of the last places to pick up bargain properties in France apparently having done no research and with just an idea that they could turn outbuildings into holiday cottages – gîtes– and wait for hoards of paying guests. It’s an under-populated, very rural part of France with many charms but also poor employment prospects and is not well known as a holiday destination. In our estimation, starting and maintaining new small businesses here is very hard with the level of taxation and social charges one has to pay from the moment the business is registered. An alternative to earning more is to spend less (nothing revolutionary there!) and we hope to reduce spending on heating and water and are already noticing a reduction in our food bill (perhaps not the drink bill though!). So, back to the roof: we could have paid a roofer to do it. I would then have to work, paying taxes, to pay said roofer, who would also pay taxes on what he charged me and that’s if I could have found a roofer who could start work before 2007. 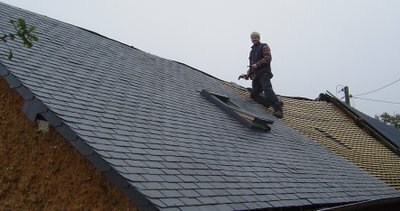 Our chosen alternative was for me to do it, paying a roofer, by the odd hour, for expert advice to guide me in my project. I started work on 27th August and finished this week. I have endured many sleepless nights and wondered, on more than one occasion, whether I had bitten off more than I could chew, but it’s all over now and I have learnt another skill, which will be useful for our straw-bale house build. Worries and doubts apart, it was often quite enjoyable, with a high vantage point to view the surrounding countryside, just the noise of birdsong and cockerels crowing and I found hanging the slates almost meditative. I’ve added up all the bills and reckon I’ve done it for between 1/3 and 1/2 of the price a roofer would have charged: thousands of euros I don’t have to go out and earn. Well done for finishing the roof!